Customer retention, success and driving up-sell are key to sustaining and accelerating your companies growth goals. Because of this, one of the most important metrics a SaaS business can measure is churn. Yet in spite of this, research shows that the majority of SaaS executives only measure churn at an aggregate level as a percentage of overall customers and associated revenue lost. In doing so, an opportunity is lost to gain insight into early stage indicators of increasing or decreasing churn trends, and ultimately, the health of your business, not to mention a lost opportunity to accelerate growth. Why is SaaS Churn Important? On the surface everything looks great, but, their churn rate is 4% m/m. Looking at the table below, we can see just how much revenue will be lost if they are unable to lower their churn. Looking at the data, we can see that they need to invest 5% of their annual revenue just to maintain the same number of customers instead of spending that cash on building out their customer success team or investing additional money in sales and marketing. Beyond that, look at the impact these different churn metrics will have on their MRR growth over the next 12 months. 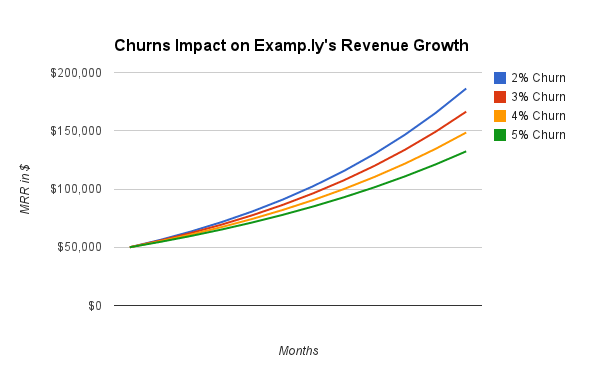 If churn was lowered to 2% Examp.ly would save $163,960 in what is otherwise lost revenue. Once again, this data is entirely fictitious, but it does clearly illustrate how churn is incredibly important to SaaS growth. Today, we’ll take a look at four ways CMOs and marketing leaders can measure churn and can gain visibility, increase forecasting accuracy, and make more informed decisions . 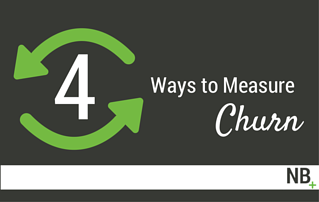 Measuring churn at an aggregate level is not enough. No aggregate is ever going to perfectly communicate a particular customer behavior, and leave a larger margin for error or misinterpretation. While an initial aggregated churn metric will never tell you the entire story, it cues you in and forces you to dig deeper for answers - answers to how you can retain more customers and successfully grow. Why it’s important: Allows you to see as a percentage of total accounts at a high level and can be compared overtime to see larger trends. Why it’s important: Allows you to see the revenue impacted because of your churn rate to adjust forecasting, hiring, and long-term growth goals because of your churn rate. Why it’s important: This metric allows in a subscription model with unlimited seats what accounts are decreasing usage, and may be more likely to churn entirely in the future and deserve immediate attention from your customer success team. Why it’s important: Revenue churn should also be measured by these downgrades that are slowing growth rate, are indicative of lower product use, and when measured proactively, can be leveraged as predictive indicators of the customer churning entirely in the future and can be used as a way to direct customer success resources and attention. At the end of the day, it is revenue that matters the most, but by understanding, monitoring, and reporting on churn at a granular level great SaaS companies are able to better understand the needs of their customer, the strengths and weaknesses of their product, and can be used to look backwards to see what sales and marketing tactics drive customers with longer retention rates, and therefore higher lifetime value. By analyzing churn and the factors that influence churn at a granular level, businesses are able to gain a better picture at the true health of their business. This is especially important in an era where customer success is critical for scaling success.